Feral Media stages irregular events in and around Sydney – keep an eye on the News pages, or follow us on Facebook, to keep in touch with latest updates. 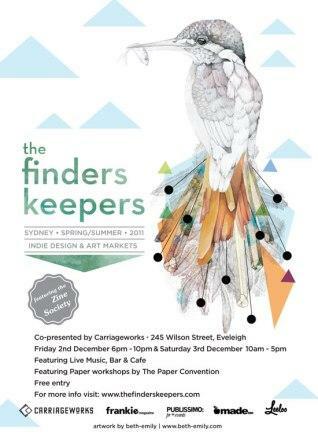 We are very excited to once again be holding a stall at the upcoming Finders Keepers markets at CarriageWorks in Sydney. @ Kings Cross Hotel, Kings Cross, Sydney. New Weird Australia & Octopus pi present Underlapper’s ‘Softly Harboured’ album launch, on Thursday 21st April 2011 at FBi Radio’s new venue – FBi Social at the newly refurbished Kings Cross Hotel in Sydney. In support, Sydney producer Cleptoclectics faces off against local compatriot Scissor Lock (fresh from the launch of his Collarbones collaboration), in the latest in their ongoing bouts of noise battles taking place in dark rooms across the city. Opening the night, solo artist Edwin Montgomery presents an inspired psychedelic tread through original songs, instrumentals and ambient textures. DJs Stupid Canon & Kimb Galercan fill the spaces along with projections from visual artist, Jeronimo. Doors 8pm. Tickets $10 on the door. More info at newweirdaustralia.com. @ Carriageworks, 245 Wilson Street, Eveleigh, Sydney. This July, the magic of a European winter comes to Carriageworks in the heart of Sydney’s inner west, for their first ever Winterland festival. The Carriageworks foyer will transform for a winter festival with an indoor ice rink, live music, a design, arts and craft market, food stalls serving alpine cuisine, dancing, karaoke and more. 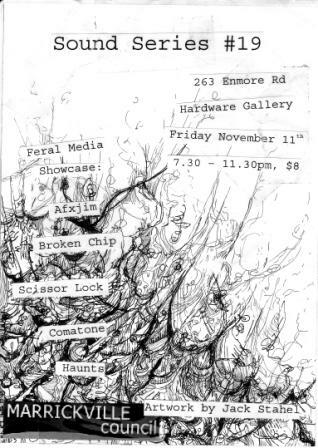 Saturday July 10th is our Feral Media night – with live music and DJ sets from Vorad Fils, Gentleforce, Afxjim, Underlapper and Textile Audio. The night also features the main Winterland attractions – The Ice Rink, Markets, Café and Bar – and venue admission is free. For more info, visit www.carriageworks.com.au. Ice Rink Sessions run from 6.30 – 10pm, pre-booking is advised and ticket prices apply.